This annual anthology brings together the year's finest mathematics writing from around the world. 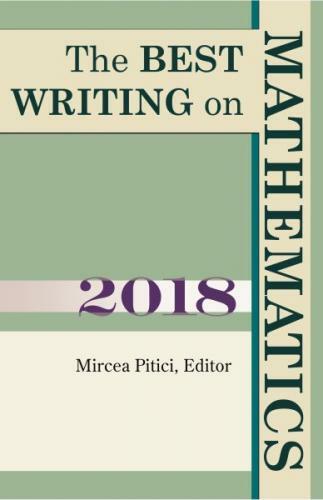 Featuring promising new voices alongside some of the foremost names in the field, The Best Writing on Mathematics 2018 makes available to a wide audience many pieces not easily found anywhere else--and you don't need to be a mathematician to enjoy them. These essays delve into the history, philosophy, teaching, and everyday aspects of math, offering surprising insights into its nature, meaning, and practice--and taking readers behind the scenes of today's hottest mathematical debates. James Grime shows how to build subtly mischievous dice for playing slightly unfair games and Michael Barany traces how our appreciation of the societal importance of mathematics has developed since World War II. In other essays, Francis Su extolls the inherent values of learning, doing, and sharing mathematics, and Margaret Wertheim takes us on a mathematical exploration of the mind and the world--with glimpses at science, philosophy, music, art, and even crocheting. And there's much, much more. This is a must-read for anyone interested in where math has taken us--and where it is headed. Mircea Pitici teaches advanced calculus at Syracuse University. He has a PhD in mathematics education from Cornell University and is working on a master's degree in library and information science at Syracuse's iSchool. He has edited The Best Writing on Mathematics since 2010 and lives in Ithaca, New York.